Humidity is the worst. If you live somewhere that’s always humid or rainy like I do, then you know the problems it causes when there’s too much inside. High humidity levels lead to odors, mold, and dust along with bugs such as cockroaches, which bring their own flair of problems. But dealing with those health and home problems have become a thing of the past thanks to the best dehumidifiers. 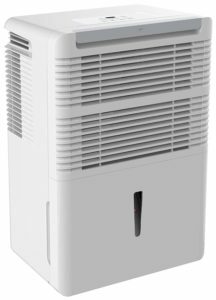 I’ve spent hours looking up the best dehumidifiers and have gone through quite a few experiences with them. Although air conditioners fight daily to lower temperatures inside, sometimes humidity persists. Unlike air conditioners, the best dehumidifiers help you eliminate dust mites, mold spores, and musty odors. Plus it also helps you lower your utility bills because your air conditioner won’t need to constantly run. To help you pick the perfect one for you, we’ve compiled a list of the best dehumidifiers that you can buy today and own tomorrow. Frigidaire is a well-known company in the consumer home appliances department. I’ve used their air conditioners for years because they’re so durable. So, it’s no surprise that the Frigidaire FFAD5033R1 is the best dehumidifier that you’ll come across today. Although the Frigidaire runs constantly, it’s designed to minimize how much noise you hear. One thing to note is that anything with an exhaust and a compressor will always make noise. However, the way it’s positioned will determine how much you hear. This unit intakes air from the back and exhausts it from the side. That means that the fan will pull air through the back and push it out through the side. To get the least amount of noise out of this unit, you can place it facing a wall. It helps to position it so that it’s exhausting air in the direction with the least amount of traffic. If you don’t know where you can put it so that it won’t stand out like a sore thumb, try placing it next to a side table. No matter where you put it, just make sure that it’s central enough to catch humidity from all corners of the room. You’ll just have to play with it so you can get it in a position that best suits you. It produces 51 dB, decibel, from 10 feet away. It’ll sound like a normal conversation or a small window air conditioner. Nonetheless, it’s an amazing choice for a quiet 70-pint dehumidifier. Mold grows in temperatures around 70 degrees. The relative humidity (RH) needs to be below 60%, ideally around 40-50% to prevent that from happening. You can set the humidity levels between 35% and 85% and it’ll continue to run until you have your desired RH. Although the Frigidaire only works in temperatures between 41°F (5°C) and 90°F (32°C) it still removes an exponential amount of humidity in short amounts of time. An example would be that it can lower RH levels in a 1,200 sq. ft basement from 72% to 50% overnight. Also, it’ll produce some heat but that’s to be expected since it’s continuously working to lower humidity levels. The Frigidaire is designed to hold 70-pints of moisture in a 24-hour cycle in areas up to 2,500 square feet. Its water reservoir container can hold 13.1 pints. 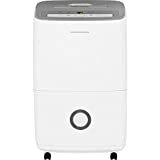 This dehumidifier weighs 47 pounds but with its top handle and wheels, it’s easy enough to roll from room to room. It’s off-white and gray body fits well with any decor style. Since it’s 11.6 x 15 x 24.4 in., it won’t take up much room. There’s also a drainage adapter located on the side of the Frigidaire that’s covered by a side door. In addition to this, there’s also a cord storage in the back for safe storage. Its interior design has a front-loading water bucket with a carrying handle and splash guard. You don’t have to worry about taking the moisture out the air only for it to end up soaking you. The Frigidaire has easy-to-use features that take the guesswork out of operating it. If you’re using the Frigidaire somewhere that you can’t drain the excess water, you’ll have to dump it out every couple of hours. To make sure that you’re getting the most out of this unit, it automatically shuts off when the tank is almost full. It also alerts you when the tank is almost full so you’re reminded to empty it so it can continue to do its job. However, if you do have it somewhere that it can drain, then you don’t have to worry about emptying the tank. This unit gives you the option to continuously drain the excess water so it doesn’t automatically shut off or start beeping when full. It lets you control the amount of humidity. In 5% increments, you can set it between 35% and 85%. In addition to this, you also have buttons that tell you if the bucket is full, if the filter needs to be cleaned, the fan speed, and a timer. If you’re not around to hear the Full Tank Alert System, the bucket full light will illuminate to ensure you know that it’s time to empty it. After 250 hours of usage, the clean filter light will come on to ensure that it’s operating at its maximum capacity to reduce bacteria, room odor, and airborne particles. To clean it, all you have to do is wash it. Once you’re done, press the filter reset button. The fan has three settings: high, medium, and low. Depending on how much humidity you have and how quickly you want it removed, you decide how fast you want the fan to run. You can set the timer to delay start or delay stop anywhere from 30 minutes to 24 hours. It also has an auto defrost feature. The Frigidaire is made with all-around high-quality material to guarantee your satisfaction. The buttons give off a strong, bright illumination and aren’t flimsy. 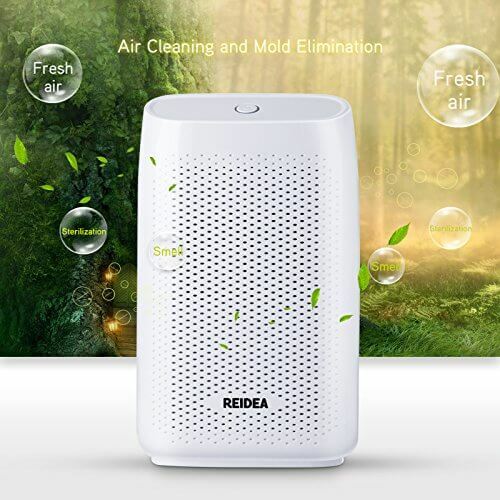 The filter is made from antibacterial mesh so that it can catch all the airborne particles such as dust and mold spores. It’s UL Safety and Energy Star certified, making it an energy efficient option. It can consume a maximum of 745 watts, but the amount of energy it consumes isn’t a direct correlation to how efficient it is. It’s actually both the power consumption and moisture removal that determines that. Because if a dehumidifier takes too long to lower the RH levels but consumes less power to do so, then it’s likely you’ll have a high utility bill. On the other hand, if it can lower RH levels quickly by using more power, then it’s getting the job done fast and efficiently. The Frigidaire comes with a full one-year parts and labor warranty and a limited 5 year sealed system warranty. Hygrometer accuracy is off. The hygrometer on the Frigidaire doesn’t accurately tell you how much humidity is in the air. The accuracy can vary in either direction. Since the sensors on these units weren’t designed to scientific standards, it’s expected for them to be a little off. You can buy a separate hygrometer to measure the humidity in a given area, so you can tweak the humidity levels for your comfort. The top handle doesn’t help alleviate the weight. It weighs 47 pounds – not something most people would consider light. If your home doesn’t have stairs, then you can use the wheels to move it from room to room. However, if you plan on using it in your basement, attic, or anywhere that requires you to use the stairs, you may want to consider the weight. To make your life easier when trying to move it up and down the stairs, empty the water out. The Keystone KSTAD70B came in a close second to our top pick. But make no mistake, it’s still a reliable unit that’ll exceed your expectations. Let’s look at the details for why this is one of the best dehumidifiers that’ll help you enjoy some high-quality air. Similar to the Frigidaire, the Keystone exhaust air on the side. So the air isn’t being pushed in your direction to increase the amount of noise you hear. As long as you position it at an angle that can dehumidify your chosen space and exhaust air so that you can’t hear it, you’ll be fine. However, what makes this model so special is that it’s one of the quietest 70-pint dehumidifiers you can purchase today. It produces around 50 dB when the fan is on high and you’re standing 10 feet away. Both the Frigidaire and Keystone allows you set humidity levels between 35% and 85% so that you can adjust it to your desired comfort. But its optimal performance occurs between 41°F (5°C) and 95°F (35°C). As a reference point, in a 1,000 sq. ft basement, it can lower humidity levels from 80% to 45% in approximately 3 hours. Something to note is that it will produce heat when it’s dehumidifying an area. Changing the chemical form of moisture from a gas to a liquid requires heat. Just like a block of ice needs to be heated up to turn into water, moisture isn’t different. Like the Frigidaire, the Keystone holds 70-pints of water in a 24-hour cycle. However, our best dehumidifier can only perform in a maximum area of 2,500 square feet. The Keystone can extinguish the moisture out of an area that’s 4,500 square feet. Its water reservoir container can hold 10.1 pints. It weighs 40 pounds and you can move it from room to room using its four rolling casters. With its glossy, white exterior, it’ll make a nice addition to your home’s decor. Because it’s an 11.25 x 15.5 x 23.25 in unit, you can fit it in most places. The controls are designed to help you get the most out of your dehumidifier without you struggling to understand them. It doesn’t come with a built-in pump. However, it has a drainage port that you can attach a garden hose to (that’s not included) and drain your water into so you don’t have to empty it. You can also utilize the continuous mode setting so that it’s always dehumidifying without stopping to be emptied or waiting for the surrounding area to reach a certain RH level before kicking back on. If you don’t plan on using it somewhere that you can allow it to drain the water freely, then you can always empty it yourself. You don’t have to always check the water reservoir to see if it’s full, because the bucket full light will come on and the unit will turn off when it’s time to empty it. Also, the water tank comes with a transparent water level indicator. The humidity can be set in 5% increments. Also, the hygrometer reads humidity levels in 1% increments for more accuracy. After 250 hours of operation, the clean filter light will illuminate. Once you’ve taken it out and pressed the filter button, it’ll reset. The fan comes in turbo and normal which translates into high and low. The timer can be set from 0.0 hour to 24 hours. You’ll use the timer to either automatically start or stop dehumidifying after a certain amount of time. While it might seem pointless to have, you’ll only use the 0.0-hour function to turn the timer off. When the Keystone is in an area with temperatures below 41° F, frost will start to freeze the coils. However, it comes with an auto defrost feature and light so you know when it’s in use. The compressor will turn off and the fan will continue to run until all frost on the coils has melted. It also automatically restarts in the event of a power outage. The Keystone is UL Safety and Energy Star certified. It can consume a maximum of 720 watts. But unless you’re using it to remove extremely high levels of humidity, you can expect it to run 20% less than that. What does this mean for you? It means that you don’t have to worry about it cranking up your utility bills. The Keystone comes with a full one-year parts and labor warranty and a limited 5 year sealed system warranty. Small water reservoir. The Keystone can only hold 10.1 pints of water at a time. That means if the area you plan on using it in is extremely humid, you’ll have to empty it quite often. Unless you’re going to drain the water via a garden hose, there isn’t really a way to offset this inconvenience. The water bucket leaves much to be desired. The handle for the bucket bends easily. There’s no splash guard to prevent the water from touching you. When emptying it, hold the bottom as well as the handle so you’re not putting too much pressure on it. Also, don’t walk carelessly with it so you don’t have to deal with the watering splashing on you. Although hOmeLabs is a relatively new brand, that doesn’t mean that they should be overlooked and disregarded. Unlike older model dehumidifiers, the hOmeLabs HME020031N caters to what customers need the most in these times. Although it didn’t beat our top pick, it still provided itself worthy of being considered one of the best dehumidifiers for consumers. Similar to the Frigidaire and the Keystone, the hOmeLabs exhausts air on the side. You’ll position it to where it eliminates the most amount of moisture it can while it’s also exhausting air towards the least busy corner of the room. It produces 51 dB from 10 feet away. This best dehumidifier option sounds like a microwave. All dehumidifiers, including this one, let you customize your humidity levels anywhere between 35% and 85%. For maximum performance, it needs to be at temperatures between 41°F (5°C) and 95°F (35°C). In these conditions, it can remove 5 gallons of water from a 500 square feet basement in roughly two weeks. A common trait shared by all of the best dehumidifiers on this review is that they all produce heat when zapping the air of any moisture. The hOmeLabs is a 40 pound, 70-pint dehumidifier that runs in 24-hour cycles. It can dehumidify up to 4,000 square feet. The water reservoir can hold 12.8 pints of water at once. Not only is it lightweight, but it also comes with two side handles and four caster wheels for extremely convenient transporting. It’s a modern, white build that’s very pleasing to the eyes. If size is an issue for you, don’t worry because it’s only 15.4 x 11 x 24.3 inches. Conveniently, the power cord storage area is on the back. The exterior also houses a knob that covers and protects the drainage port. The interior is where the water bucket and its handle is tucked away. The hOmeLabs comes with a drainage port that you’ll use simultaneously with its continuous mode to ensure that your home is never above a certain humidity level. Plus, you won’t have to worry about emptying it. But the handle on the water bucket makes it easy to empty it if that’s your only option. Also, it comes with a transparent water level indicator and a full light that’ll come on when the bucket’s full. You can set the humidity in 5% increments. It has the same filter usage, fan speed, and timer as the Keystone. Also, it comes with a auto defrost and auto restart in the event of frost on coils and a power outage, respectively. The build quality for the hOmeLabs is about the same as the Frigidaire. The plastic and filter are of high quality. The hOmeLabs is UL Safety and Energy Star certified. It consumes 6.5 amps which are the equivalent to 780 watts. To lower humidity in a moderately humid area, it’ll take 25% less than the maximum wattage. The thing we like most about the hOmeLabs is its two-year warranty plus 6 months if you register it online. It’s common for something that’s constantly being used to eventually have problems. This dehumidifier proves that it’ll go above and beyond to make sure that consumers are satisfied, even years after their purchase date. No splash guard. The water bucket doesn’t have a splash guard to protect you from the water splashing on you. Although it does have a handle, you still need to move very carefully or you might end up with more water on you than you hoped for. The fill line indicator is hard to see. The bluish, green indicator isn’t very noticeable from far away. While it would be convenient to know how much water is inside at a glance, there’s still the full bucket light that can tell you when it’s time to dump the water. There’s no denying it. A dehumidifier can substantially improve your quality of life. If you’re looking for a dehumidifier that has some simply remarkable features then your best bet is the Frigidaire FFAD5033R1. If you would prefer a relatively quiet unit, then you need the Keystone KSTAD70B. And if you’re looking for something that gets the job done for less and has a subpar warranty, then the hOmeLabs HME020031N is perfect for you. It doesn’t matter what dehumidifier you choose. More importantly, what matters is that you’re living a cleaner, healthier life without humidity, mold, and dust. Since the best dehumidifiers will help you cut back on dusting, take a look at our best vacuum cleaners to see how else you can save time. What size is right for me? Dehumidifiers come in 30, 50, and 70-pint sizes. While it seems logical to buy a 30-pint unit if you don’t have much square footage, it’ll still cost you. A 70-pint unit can dehumidify an area faster and more effectively than a 30 or 50 sized one. That’s also why I only listed 70-pint dehumidifiers – they save you time and money in the long run. These best dehumidifiers are also more energy efficient. 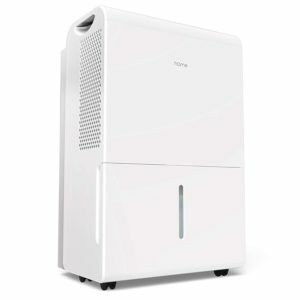 Can a dehumidifier help me fix humidity problems I already have? No, it can only help you with problems you don’t have yet. Keep in mind that if you already have mold or water stains on the ceilings or walls, even the best dehumidifiers can’t fix that. Solve the problems you have first, then build on improving. I hope this guide to the best dehumidifiers can help you find the right solution for you. This entry was posted in In Depth Product Reviews and tagged dehumidifier, home appliance. Bookmark the permalink.